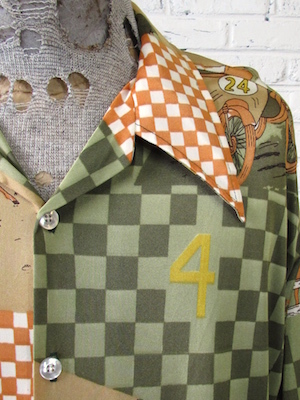 Home > Men's Vintage Shirts > Men's Vintage Shirts: 1970s > (L) Vintage Mens 70s Disco Shirt! Disco at the Races! Horse Race, Car Race & More!!! Mens vintage 1970s disco shirt. 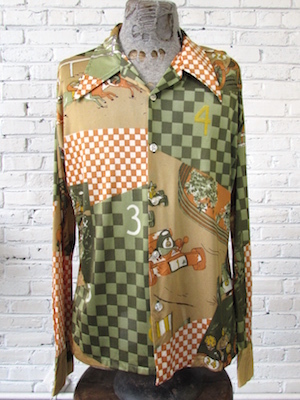 A funktastic disco shirt for a racing fan! Shirt comes in orange, white, dark green, sage green, tan, yellow and black. This crazy pattern features a variety of different racers including race cars, horses and motorcyclists! Between the images of racing action are checkers and big numbers! Has a super wide & pointy disco era collar. Closes in the front with pearly white buttons with one matching button on each cuff. Shirt has a straight hem. Tagged by Palm Springs. 65% Acetate / 35% Nylon.